I have started posting translations of posts from a veteran coin/bank note dealer at the Lugong Market in Shanghai. The topics cover both precious metal coins and circulating coins. The author calls himself Dandan (Eggy), without giving his real identity, stating that his purpose is to educate new collectors/investors of Chinese coins, who have average budgets. His perspectives are well worth noting for those interested in Chinese coin collection and investment. He assigns a “collection index” and a “investment index” to the coin he discusses, which provide useful clues to those acquiring Chinese coins. (About Chinese circulating coins: apart from precious metal coins, the Chinese circulating coins are nice investments, too, or even better investments than the former. As the post below shows, the Ningxia circulating commemorative coin, for example, is selling at around 1,000 yuan. 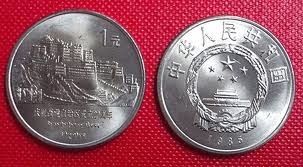 In terms of percentage of growth, it beats most precious metal coins hands down, as it was available from the bank for 1 yuan when it was first issued in 1988. Circulating coins are ideal investments especially for those with a smaller budget. Here we are talking about Commemorative Coins for Tibet, Guangxi, Xinjiang, Inner Mongolia and Ningxia. Among these, Ningxia is the most expensive, and Inner Mongolia is the least expensive. Their pricing is directly dependent on their mintage. Ningxia has the lowest mintage, and so it is the most expensive. Inner Mongolia has the highest mintage, and so it is the cheapest. My favorites are Tibet and Xinjiang. The design of the Potala Palace on the Tibet coin is extremely exquisite, truly beautiful. 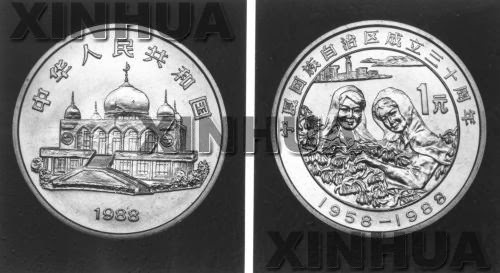 The Harvest Scene on the Xinjiang coin is amazing, too. Moreover, the mintage is low. 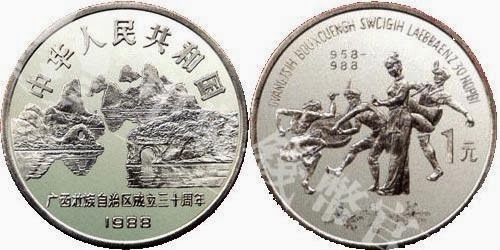 As the third commemorative circulating coin, it is only RMB 120-130 a piece now, good for both investment and collection. Great stuff, with big future upside potential, as long-term investment. The mintage of Inner Mongolia is too high. It would be fine to buy one for collection, but not for investment. It is the target for speculation and hyping. Ningxia is good for both investment and collection, but as it is priced over RMB1000, only speculators and buyers with a deep pocket can afford it. The problem with Guangxi is that the coins were packaged in soft paper, which absorbs moisture easily, making storage difficult. So I do not recommend it.